Brand New Jameson Limited Edition Whiskey Pourers. Condition is New. Dispatched with Royal Mail 2nd Class. 100 jameson whiskey Muddlers. . Condition is New. Dispatched with Royal Mail 2nd Class. Ideal Gift/New Boxed! Boxed Weight: 340g. Square Shape - see main pic. Jameson Whisky Glass. Condition is New. Dispatched with Royal Mail 2nd Class. x5 New Jameson Irish Whiskey Copper Colour Tin Barrel METAL Shot Glasses Retro. Condition is New. Dispatched with Royal Mail 2nd Class. Size - 32cl 320ml. Quantity - 2 Glasses. A bit about BrewerianaUK. Size - 32cl 320ml. Quantity - 1 Glass. Size - 32cl 320ml. Quantity - 2 Glasses. These are quite heavy tumblers. A brand new very stylish Jameson tumbler with tapered sides and a heavy base featuring the John Jameson Son etched logo and red seal on the front and embossed name in the bottom of the glass and a 4cl measuring line at the back. Standing 13.4cm tall with a 8.4cm diameter and weighing 0.311kg This stunning glass would enhance any bar, collection or make a super gift. Will dispatch immediately and contents will be secured safely. Great for any party or as a gift. Over 380g of weight each glass. 14cm tall and 8cm across the top each. Four lovely Jameson Irish Whiskey Glasses with stems. These are great for cocktails and have a lovely vintage look about them, they look quite impressive. They are in great used condition and come from a pet free, smoke free clean home. 30ml each glass. Great for any party or as a gift. Around 74g of weight each glass. 5.5cm tall and 5cm across the top each. Two lovely Jameson Irish Whiskey Glasses with stems. These are great for cocktails and have a lovely vintage look about them, they look quite impressive. They are in great used condition and come from a pet free, smoke free clean home. JAMESON TUMBLERS 2 x stylish Jameson tumblers with tapered sides and a heavy base featuring the John Jameson Son etched logo and red seal on the front and embossed name in the bottom of the glass and a 4cl measuring line at the back. Standing 13.4cm tall with a 8.4cm circumference and weighing 0.311kg These stunning glasses would enhance any bar, collection or make a super gift. Will dispatch immediately and contents will be secured safely. 6 x Jameson Hiball Glasses. On trade so not normally available to buy in store. ATV, Quad Parts. Hobby, Repair Parts. Car, Caravan. This varies depending on your location, and the options are displayed at the top of each ad. UNITED KINGDOM. United Kingdom. Car, Caravan, Boat, Trailer. Jameson Irish Whiskey Tall Glasses - Set of 6 - Brand New Condition! 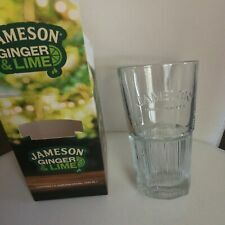 Jameson Irish Whiskey Tall Glasses - Set of 6 - Brand New Condition!. Condition is New. Dispatched with Royal Mail 2nd Class. Size - 32cl 320ml. A bit about BrewerianaUK. 6 Vintage Jameson Irish whiskey copper-coloured Tin barrel shots oldschool. Condition is New. Dispatched with Royal Mail 2nd Class. Lovely Glass, ideal for the longer drink.